Our Preschool Program introduces a balanced program in which both teacher and student directed learning is done. Our center based classroom layout allows for the preschoolers to explore, be creative, and develop critical thinking skills through the engagement of individualized centers. Integrated into the weekly thematic lesson plans and daily projects are the following subject areas of math, social studies, science, literacy/English Language Arts, art, blocks/cars, dramatic play, and sensory tables, along with sign language. 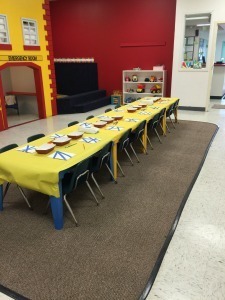 All lesson plans and instruction are modified to meet the various needs of the preschoolers. These needs are met by the preschool teachers differentiating their teaching accordingly. As some of the preschoolers are taking home "Visiting Ollie", who is a cabbage patch doll that helps encourage and foster cognitive recognition, independence, and routine, other students are sharing a "Book in a Bag" with their peers and families to learn and enhance recall, comprehension, and sequencing. As a collective group, our beginning readers are introduced weekly to various CORE skills by having fun with The Big World, a thematic scholastic magazine. Throughout the day active learning is ongoing in our preschool, fulfilling the social, emotional, and academic needs and learning of the students. At pick-up time, parents/guardians will receive a "Daily Gram", which allows the preschool teacher to provide families with daily communication of their preschooler's day. In the gram the parent/guardian will know what they ate, enjoyed and learned throughout the day, and any pertinent information relating to their day. All our classrooms have an "Open Door Policy" and we encourage families to call and or visit your child's classroom at any time.